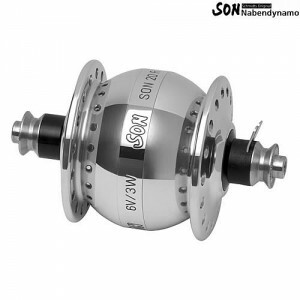 Schmidt dynamo hubs are arguably the best available to purchase today. Certainly if what you are looking for is longevity, they are tough to beat. They are generally rated at 40,000km between service intervals. The sealing on them is superb and the modern versions are competitive when it comes to weight and drag. Schmidt lights can also be offered. The SP hubs are a good deal less than the Schmidt version which makes them very appealing. The flanges are thinner making them build into flexier wheels and the internals are less reliable, however they still offer a decent option for those looking for a dynamo setup. The full range of B&M lighting and charging products are available to go with your dynamo wheelsets. The CYO IQ, Luxos U and USB-Werk are among the most interesting products in their range.